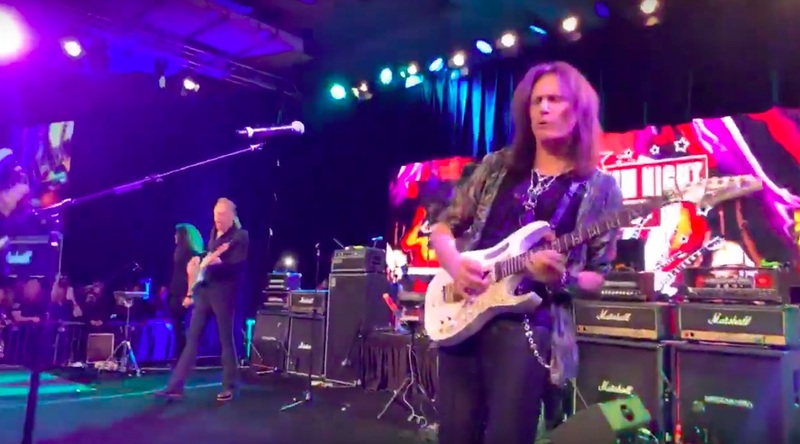 The members of David Lee Roth’s original solo band reunited for a rare performance at 2019 NAMM (National Association of Music Merchants) convention in Anaheim, CA on January 26. The “Eat ‘Em And Smile” band – featuring guitarist Steve Vai, bassist Billy Sheehan, keyboardist Brett Tuggle and drummer Gregg Bissonette – were joined by guest vocalist Jeff Scott Soto at the annual event’s Ultimate NAMM Night for a two-song set that featured a cover of Queen’s “Tie Your Mother Down” and, “Shy Boy”, a track originally recorded by Sheehan’s Buffalo, NY band Talas that was included on Roth’s 1986 solo debut. 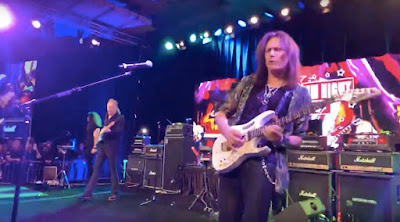 The performance follows an aborted 2015 reunion of the lineup with Roth in Hollywood, which was shut down at the last minute by the fire marshall due to concerns over the crowd size at Lucky Strike Live. “I apologize about this evening. Looks like we were too popular,” Roth told fans while signing autographs as he left the venue that night. “There were too many folks, so we’re going to try and find a place that has… should we go to the Hollywood Palladium maybe?”, which led to speculation about another show or possible tour. Roth released "Eat 'Em And Smile" in the summer of 1986 following his the success of his 1985 EP “Crazy From The Heat” and his departure from Van Halen that same year. The album was previewed with the US Top 20 single “Yankee Rose”, and hit No. 4 on the US Billboard 200 on its way to selling more than 2 million copies in the States alone. In recent months, Roth has hinted at a 2019 return of Van Halen, while rumors continue to surface after a three-year hiatus by the band. Van Halen delivered the No. 2 Rock News Story Of The Year and were named the No. 10 Rock News Artist Of The Year as part of the 2018 hennemusic Rock News Awards.